The New Kid is back in a brand new role-playing mobile game. Get your iOS on the links below and Android here! LOS ANGELES – June 12, 2017 – Today, Ubisoft® and South Park Digital Studios announced South Park: Phone Destroyer™, a new free to play mobile game. Developed by Ubisoft studio RedLynx, in collaboration with South Park Digital Studios, the game combines real-time combat with traditional trading card collecting. It will release worldwide both on the App Store and Google Play in 2017. In South Park: Phone Destroyer™, players once again assume the role of the New Kid and team up with South Park characters to play a new game with cowboys, pirates, cyborgs and even almighty gods. Take your gang on a new single-player adventure featuring an original story. Full of fun, explosive battles and irreverent humor, players build and upgrade an all-powerful team to master the true strength of the cards they acquire. Upgrading and learning to use cards strategically is key to competing at the next level: the real-time Multiplayer mode. Player versus Player combat challenges players’ skill and knowledge needed to defeat opponents in order to rise up the global multiplayer ranks. Set in the familiar South Park universe, South Park: Phone Destroyer™, brings the most outrageous card collecting and real-time PVP experience to mobile platforms. Full of jokes, favorite characters, and tense combat, the game is an authentic extension of the TV show that matches South Park’s look and feel. Game audio is also true to the South Park™ universe with character voiceovers by Trey Parker and Matt Stone. For the latest on all of Ubisoft’s games, please visit www.ubiblog.com. 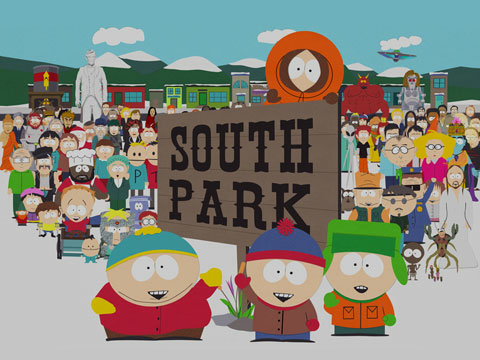 South Park Digital Studios is a joint venture between Viacom and Matt Stone and Trey Parker, the creators of the Emmy and Peabody Award–winning series South Park. South Park Digital Studios is a digital animation and development studio dedicated to creating mobile and digital applications, digital goods and video gaming products, as well as overseeing social networking and digital syndication for South Park. South Park Digital Studios owns and operates the website southpark.cc.com and three international versions of the site. South Park is a registered trademark of Comedy Partners, a wholly owned unit of Viacom Inc. (NASDAQ: VIA and VIAB). Ubisoft is a leading creator, publisher and distributor of interactive entertainment and services, with a rich portfolio of world-renowned brands, including Assassin’s Creed, Just Dance, Watch_Dogs, Tom Clancy’s video game series, Rayman and Far Cry. The teams throughout Ubisoft’s worldwide network of studios and business offices are committed to delivering original and memorable gaming experiences across all popular platforms, including consoles, mobile phones, tablets and PCs. For the 2015-16 fiscal year Ubisoft generated sales of €1,394 million. To learn more, please visit www.ubisoftgroup.com. RedLynx, a Ubisoft studio, is located in Finland and is best known for its award winning and best-selling physics-based racing series Trials®. Previous installments such as Trials Evolution® and Trials Fusion™ amazed the fans with innovative gameplay and new types of social features. In 2014 Trials Frontier™ brought the series to mobile platforms for the first time, having resulted in over 55 million downloads since its launch. The studio continues to put its energy into exciting the fans of the Trials franchise, and also expanding its portfolio of groundbreaking titles on all platforms.